Justice Rana Bhagwandas, a Hindu, took oath here on Wednesday as acting chief justice of Pakistan in the absence of Chief Justice Iftikhar Muhammad Chaudhry who left on a foreign tour. 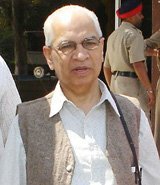 Justice Bhagwandas, the senior-most judge of the Supreme Court after the chief justice of Pakistan, had held this temporary charge in September last year too. Born Dec 20, 1942 in Sindh, Justice Bhagwandas joined the Pakistan judicial service in July 1967. He was elevated to the Pakistan High Court in 1994 and joined the Supreme Court in 2000. Justice Bhagwandas is the second non-Muslim judge in Pakistan to reach the top position in the judiciary. Justice AR Cornelius, a Christian , had served as the chief justice during 1960-68. He is considered an expert on constitutional law . Besides graduation in law, he has also done his masters in Islamic Studies. Islamic Republic of Pakistan with a Hindu Chief Justice? And they still conider Pakistan a Fundmentalist state? Could Shri Bhagwandas ever become a permanent chief justice? Would he ever win the popular vote in a country where 60% of the population says they would vote for Osama Bin Laden in a Pew Center Research poll? Pakistan is a fundamentalist state where Hindus and Christians are persecuted. That is why the percentage of Hindus has declined from 24% to 1% while the percentage of Muslims in India has risen from 11% to 14%. Pakistan has committed cultural genocide against its Hindus. There is no question that Pakistan is a terrorist fundamentalist state and that it was behind virtually every terrorist attack in India. Otherwise it would hand over Osama Bin Laden, Syed Salhuddin, and Dawood Ibrahim. I don't mean to say that all pakistanis are this way or that pakistan has always been this way. The drift to fundamentalism has been very new and facilitated by Gulf countries. I'm also pleased with the reaction of many human rights activists including muslims that have been strongly opposed to the plight of most pakistani hindus. Its just that far to many Muslims are violators and far too few are concerned about the abuses. As a minority I must say, it is amazing a muslim nation is doing what its founder thaught as a land for muslims and minority. Its sad and sickening the comments of hindu fundamentalists who want not to give Paksitan its due credit, after all because of low lives like then India was divided. We compalin about Pak, look in India we are still in cast system, Dalits are miss treated we have violence and seperation movement all corners of our India, and poverty is getting worst. Come on guys accept it we are wrong, not Pakistan. Long live Pakistan for doing good with minorities and shame to fundamentalists all over world specially hndus. the nation is doomed. we got parsis( kicked out by muslims) Tibetian (kicked out by chinese) muslims in west bengal kicked out by bangladeshi's. what the hell you are talking about. go to pakistan and you would be screwed.